Evergreen's extension to Sun Mountain's sweetest uptrack is complete and ready to ride! See you up there! Special thanks to the following people who got dirty and made the woodpecker connector happen! June Updates: Rides, Trail Work, and Brewfest, Oh My! We've been talking a lot about the trails at Sun Mountain, but things are just too good, so we can't stop. Pete's Dragon is almost done! If you haven't gone out to see what we've been working on, check it out. 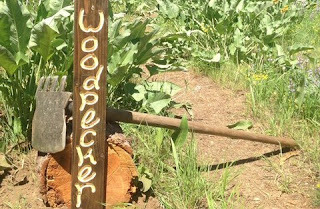 Woodpecker is finished, and with the recent moisture, trails are in perfect condition. Join us tonight at 5:00pm for a group ride to see our handiwork. Time continues to fly, so it's Second Singletrack Sunday time! We want to finish the Pete's extension, and can do it with some extra hands. We're excited to have that section complete, and will have a BBQ and ride after the trail work. Sign up here or just show up at 8. More details below. After endless bushwhacking, bee hive dodging, and back breaking manual labor, we're stoked to announce the opening of the upper section of Sun Mountain's newest climbing track! 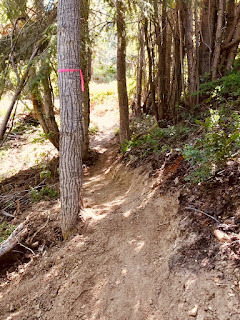 The new climb offers a shaded and flowy single track route to the top of Thompson Ridge Rd, where riders can set off on a variety of awesome descents. Please keep in mind that there is no signage as of yet, and that climbing tracks are for climbing, NOT DESCENDING. Lets keep it safe out there! 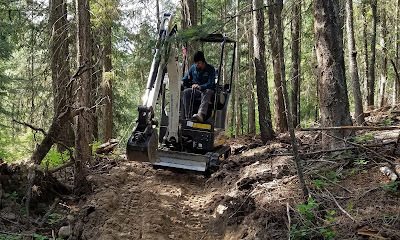 Although the lower section of the climbing track is still under construction, the upper track can be accessed by ascending about half of the Thompson Ridge Rd climb and keeping an eye out for the trail on your left. Pete's Dragon is officially open! If you're looking to get your flow on, we have some great news for you. Pete's Dragon is officially open! The new extension more than doubles the length of the original Pete's Dragon, and no matter what you riding level is, you're guaranteed to find some smooth turns and fun bumps! Brought to you by Evergreen Mountain Bike Alliance - Methow Chapter.